Tennessee assistant coach Tee Martin talks with quarterback Jarrett Guarantano (2) and receiver Jauan Jennings during the Orange and White spring football game Saturday at Neyland Stadium. Martin, a former Vols quarterback, joined the staff in the offseason. Tennessee safety Nigel Warrior (18) said bonding will be a big priority for the Vols this summer in the absence of official team practices. KNOXVILLE — Spring practice is in the Tennessee football team's rear-view mirror for this year. Yet the work doesn't stop. Although preseason camp won't begin until early August for the Volunteers, they will be working to improve before then — even if it's not in a practice setting. The things players will focus on include fundamentals, strength training and — according to safety Nigel Warrior — bonding. "Starting tomorrow, we're going to be bonding together and kicking it with each other," Warrior said Saturday night, after the Vols concluded their spring schedule with the Orange and White game. "Having fun, telling each other little secrets, stuff like that. We'll have a little popcorn movie date; something that'll keep us going." Warrior also mentioned paintball as a team activity. He was asked who the best paintball player on the team is. "I don't know yet," he said, "but it's going to be me." With the roster turnover the Vols have experienced since Jeremy Pruitt took over as coach in December 2017, bonding may be the way to go. The coaching staff has changed, too, with quarterbacks transitioning to the leadership of Chris Weinke, running backs adjusting to David Johnson and receivers answering to Tee Martin. On defense, coordinator Derrick Ansley is the only new face on the staff — though some other assistants' roles have changed — but he will fill a big role by calling plays, and he'll also coach the secondary along with Pruitt. In some cases, the bonding has been going on for a while. 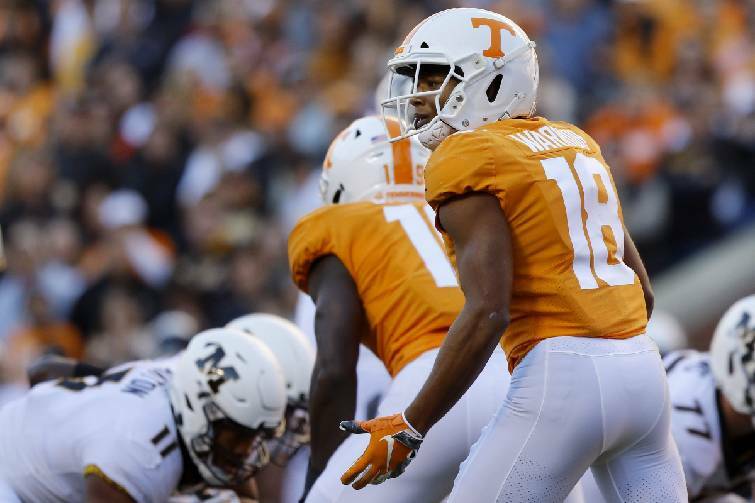 Quarterback Jarrett Guarantano has been in the program for four seasons, while receivers Tyler Byrd, Marquez Callaway, Jauan Jennings, Brandon Johnson and Josh Palmer all have been around for at least three years. The rapport has been in that group for a while and will be expected to continue for the most experienced position on the team — which means the receivers will be leaned on to provide leadership. 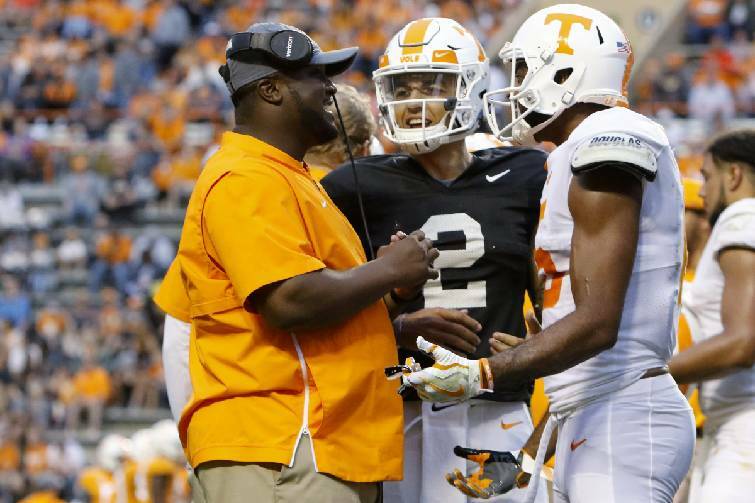 "I've been with those guys a lot," Guarantano said Saturday. "I'm going on my fourth year here, and I've been throwing to Marquez, Palmer, Brandon and Jauan ever since I got here. It's been very easy to adjust with them, and we're really starting to see the same things. The next step for us is we have to take the next thing to coverages and be able to see what we're feeling on each coverage. That comes with film study and being around each other." There will be more adjustments. Attrition in the form of transfers is possible, and the members of Tennessee's 2019 signing class who did not enroll early will be on campus to start working soon, with the incoming group headlined by five-star offensive lineman Darnell Wright and four-star linebacker Henry To'oto'o. Competition is one of Pruitt's main talking points and it will be back in the conversation, especially on the offensive line, which was probably the team's biggest weakness in 2018. The Vols added five players to that group, with Wright, Jackson Lampley and Melvin McBride set to join early enrollees Chris Akporoghene and Wanya Morris, who showed improvement during spring practices. Even in the absence of official team practices and coaches' involvement this summer, there are things players can do to improve. "You can do a lot as an offensive lineman by yourself," Pruitt said. "They put dummies on those sleds every day. Whether you're going to take a zone step or a stretch step or going to work a double team, you can do all of that on your own, and we need guys to do that. They need to have pride in their performance and go work hard this offseason. We need a really good offseason at every position." Pruitt also mentioned the improvement players have already made in the past year working with Craig Fitzgerald, the team's director of strength and conditioning, and Rachel Pfister, Tennessee's director of sports nutrition for football, and he expressed confidence players who need to improve their strength this summer will do so. And there's always movie night. "It's very important," Warrior said. "It's not just about me, it's about the whole team coming together and having fun outside of the field but bringing it to the field. "You can always improve on chemistry. We have pretty good team chemistry, which we have not had." The Vols picked up their sixth commitment for the 2020 recruiting class when three-star athlete Jimmy Calloway gave a nonbinding pledge to the program after Saturday's spring game. The 5-foot-11, 166-pounder from Morrow, Georgia, chose the Vols over offers from 11 other programs, including Georgia Tech, Kentucky and Oregon.